A competition was held to select an architect for this meetinghouse, and the person selected was ward member Peter Mortensen. His 1901 design for the building was a three-spired classical building. Foundation work began that year on the building. By December, Mortensen had an accumulated debt of $3800 for lumber materials on other projects. The treasurer for the lumber company was James Hay. Mortensen invited Hay to his home on the evening of December 16th to pay the debt. Hay went to Mortensen’s home but was never seen alive again. His body was discovered the next morning buried in a fresh mound of dirt in a close-by field. Of course the incident brought construction of the meetinghouse to a halt and brought a division in the ward. Mortensen neither admitted nor denied that he was guilty of the crime, but was tried in court for the murder. Half of the members of the ward “knew” he was not guilty and the other half “knew” he was. Those for Mortensen wanted the building to go ahead as he had planned. Those against would not contribute another penny toward its erection using his design. The impasse was cleared up by holding another competition to provide a new meetinghouse design to be used on the existing foundation. A design submitted by architect Samuel Whitaker was accepted in April 1902. After the new design was developed, construction on the meetinghouse resumed. 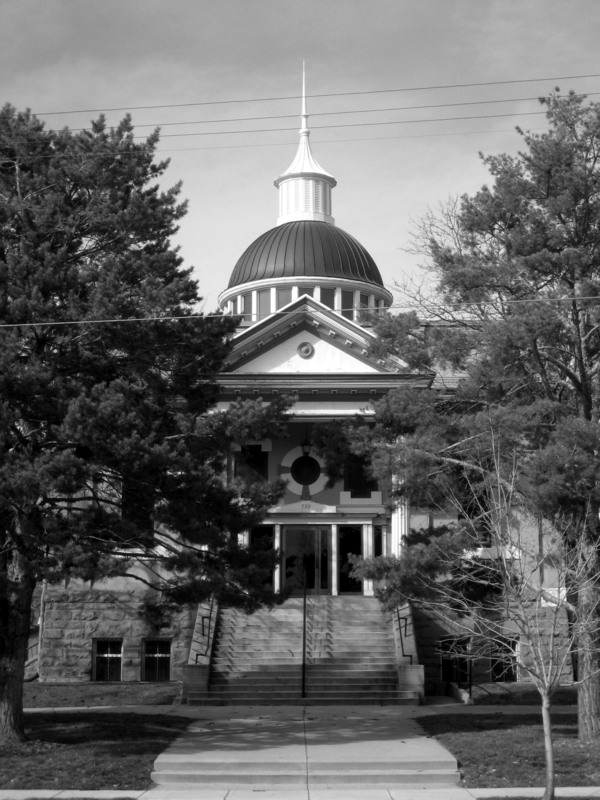 Paralleling the ongoing construction was the trial, which continued with great drama described by the Salt Lake Tribune as “the most celebrated murder trial since the days of John D. Lee and the Mountain Meadow massacre.” Mortensen’s attorneys received a death threat in July 1902 if they continued to defend him. “Your house and home will be blown to atoms in case you make a motion for a new trial.” The case continued without incident and Mortensen was tried, convicted and executed in November 1903, receiving coverage as far as the New York Times. He was the ninth person to be executed by the state. 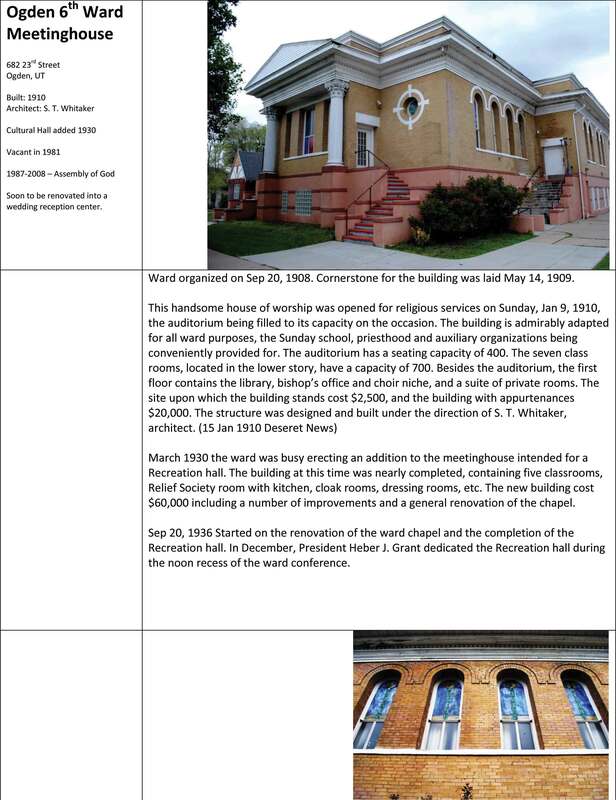 The following month, the meetinghouse was completed and began to be used for services. 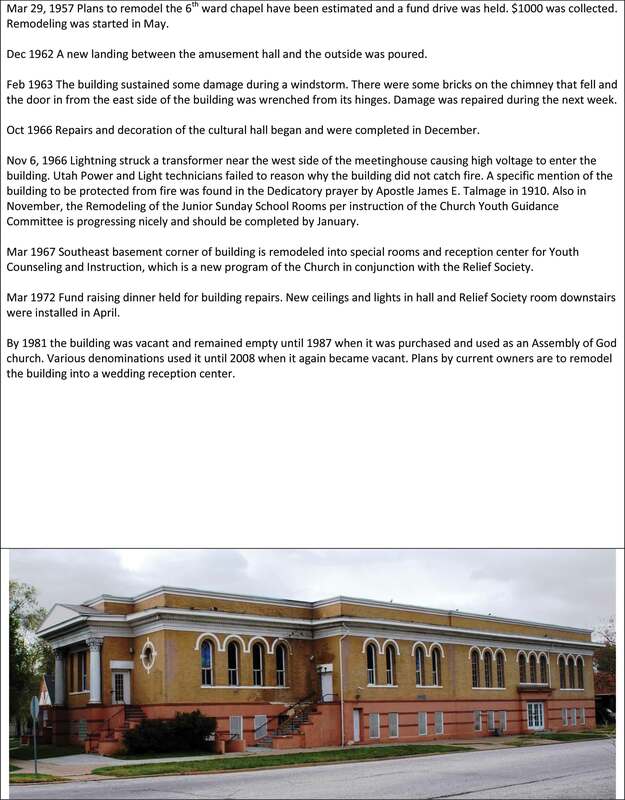 Dedication services took place in 1905 by Church President Joseph F Smith. The design of the new meetinghouse by Samuel Whitaker was quite different in appearance than Mortensen’s design, having a circular dome feature in the center of the chapel, rather than the three spires at the front of the building. 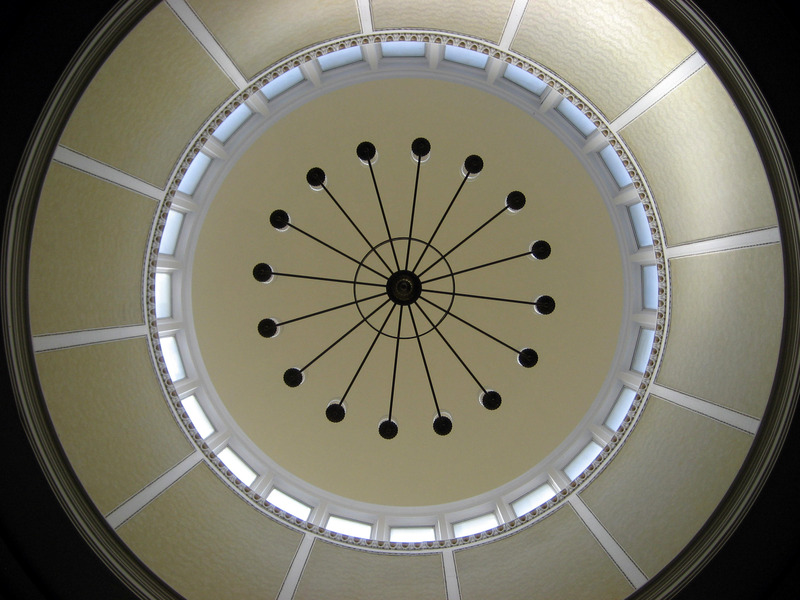 Unique to LDS meetinghouses, the dome opened to the chapel space providing beautiful natural light through clerestory windows. 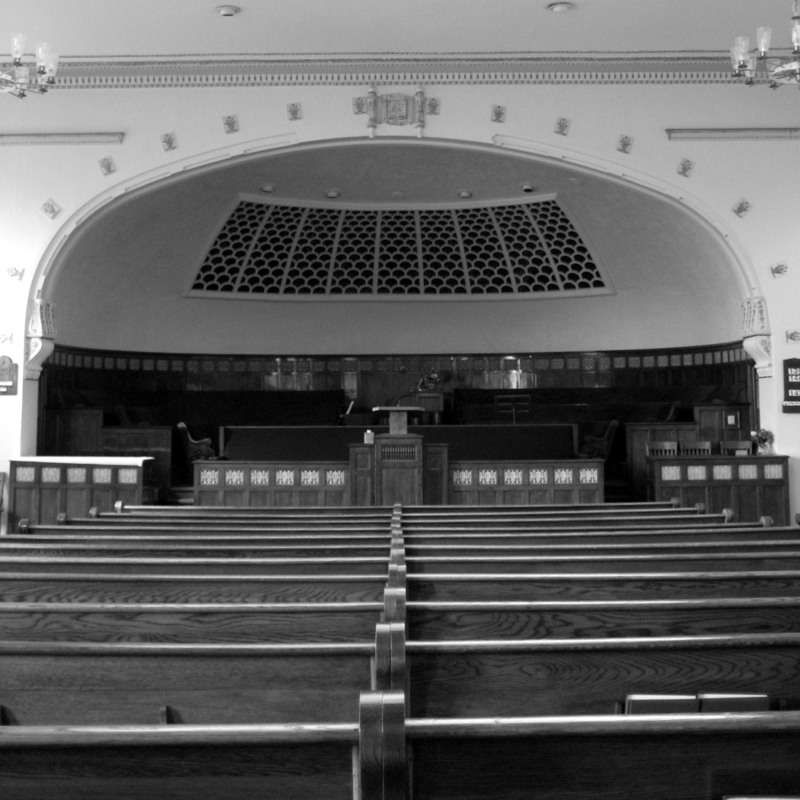 The original rostrum had classical columns on each side of the chapel. These were removed in 1929 by Cannon and Fetzer who also added classrooms and hallways to connect to the cultural hall built at the rear of the building in 1913. During the 1970’s the interior of the dome was covered over with a ceiling, but was opened again during a remodel in 1986.